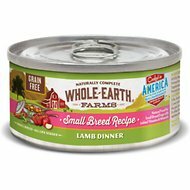 Give your pup some “goodness from the earth” with Whole Earth Farms Grain-Free Small Breed Recipe Beef Dinner Canned Dog Food. This thoughtful recipe delivers complete and balanced nutrition through high-quality, natural ingredients that are cooked in the USA. 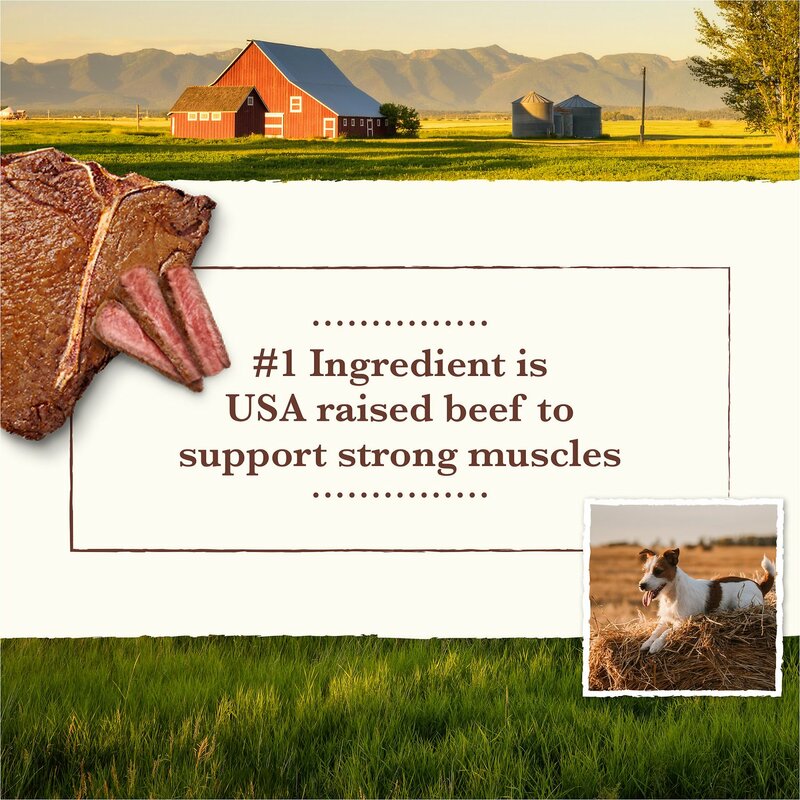 This formula includes beef as the first ingredient, and contains elements to help digestibility, reduce shedding, promote a shinier coat, increase energy, strengthen nails and support healthier skin. 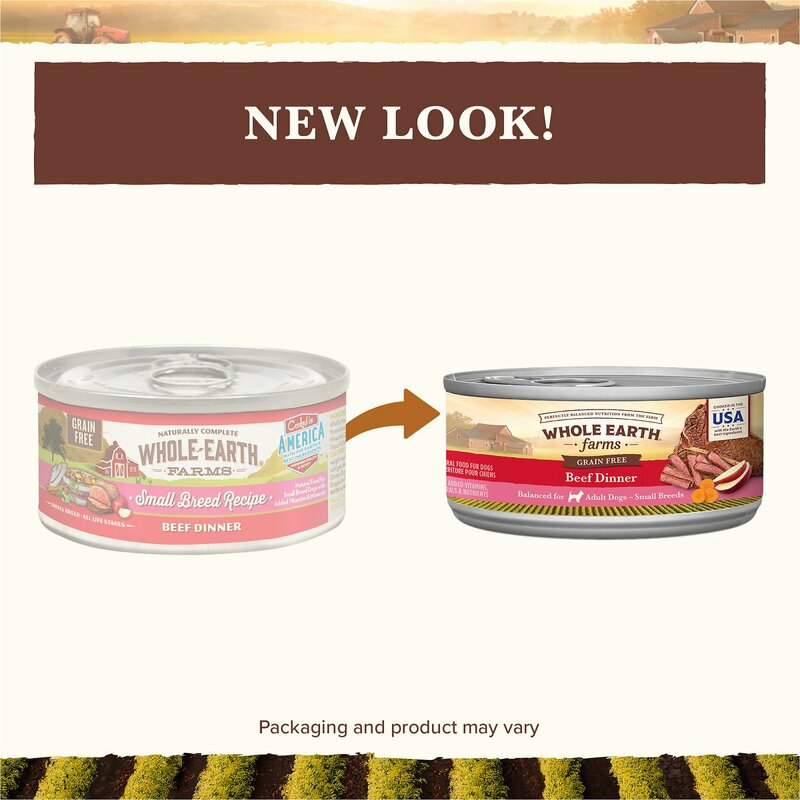 Made without any corn, wheat, soy, by-products, artificial colors or preservatives, you can be sure you’re feeding your pup quality food made from the Earth’s best ingredients. 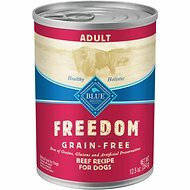 Features protein from beef and whitefish to give your pooch the energy he needs to be active. 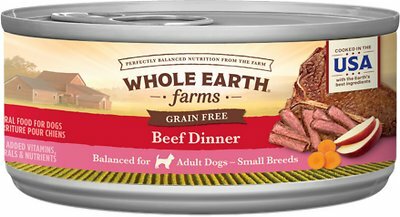 Beef, Beef Broth, Beef Liver, Lamb, Peas, Carrots, Natural Flavor, Dried Egg Product, Sweet Potatoes, Yeast Culture, Calcium Carbonate, Apples, Sodium Phosphate, Organic Alfalfa Meal, Sunflower Oil, Flaxseed Oil, Salmon Oil, Potassium Chloride, Salt, Guar Gum, Choline Chloride, Dried Cranberries, Cumin, Xanthan Gum, Cinnamon, Minerals (Zinc Amino Acid Complex, Iron Amino Acid Complex, Manganese Amino Acid Complex, Copper Amino Acid Complex, Potassium Iodate, Cobalt Glucoheptonate, Sodium Selenite), Vitamins (Vitamin E Supplement, Vitamin B12 Supplement, d-Calcium Pantothenate, Vitamin A Supplement, Niacin, Vitamin D3 Supplement, Riboflavin Supplement, Folic Acid, Pyridoxine Hydrochloride, Biotin, Thiamine Mononitrate), Yucca Schidigera Extract. Cover and refrigerate after opening. Fresh water should be available at all times. my boys love this food. I've never tried it before, but it's so wholesome and they evidently know it because they can't wait for mealtimes! My 8lb dachshund loves this food! The can size is perfect and he eats it all without hesitation! I highly recommend it! My lil dogs both love this ! Great product at a reasonable price. I feel good about the ingredients and the company it's made by. This product, whole earth canned and I believe it is organic, is just the right size to travel with the girls (my two small dogs.) We use half of a can for each one, the easy lid clip, even my 81yr old mom can use it. 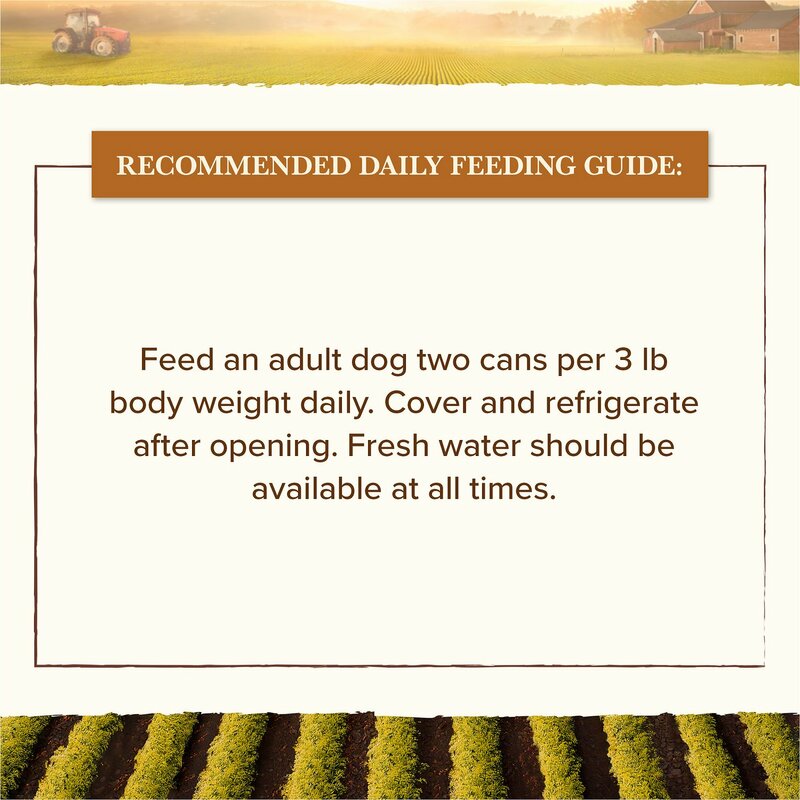 We mix it in with the dry food and the veggies we give them (yes the dogs eat fresh vegetables and fruits!). The dogs love the taste. I love your prices, convenience, variety, and the nicest people to talk to on the phone! Thank you. Only 1 problem, found a piece of plastic in the food when I opened the can. It was about 1/4 inch long, near bottom. I go through the food every time I serve it. My fussy little fur baby gives a thumbs up (okay, paw up!) to this wet food. She even allows me to put her meds in this AND she still eats it!! 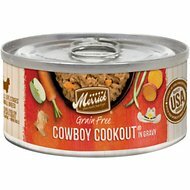 My Chihuahua mix likes this food & always finishes her food. I'm so glad that we found it & it is just the right amount for her.